Where do I use my Paulas Choice voucher code? At Paula’s Choice, you can discover a huge variety of skin care products including cleansers, toners, exfoliants, day moisturisers, night moisturisers, serums, masks, boosters, treatments, makeup, eye and lip care and body care. If you’re looking for skincare based on a particular concern you have, you can shop via concern on the Paula’s Choice website. The concerns covered by Paula’s Choice include breakouts, blackheads, anti-ageing, dull skin, Keratosis Pilaris, brown spots, redness, sensitive skin, very dry skin, enlarged pores and rosacea-prone skin. You can also shop via the collection for your required skincare, the collections available include resist anti-ageing, skin recovery, skin balancing, calm, clear, clinical, boost, earth sourced and PC4Men. Or you can shop by ingredients which include: retinol, SPF, vitamin C, peptides, BHA salicylic acid, AHA glycolic acid, ceramide, hyaluronic acid, niacinamide, omega fatty acid. As well as all this, you can also shop by bestsellers, new products, SPF products, travel sizes, sets and power couple sections to discover a wide range of products suitable for you. You can also discover a huge selection of expert advice on the Paula’s Choice website as well as a product finer, beginners guides and much more. 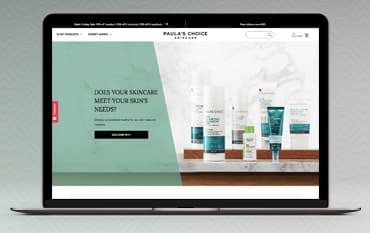 If you’re looking for helpful information and guidance on all things skincare you can check out the expert advice section on the Paula’s Choice website. Here you can find all sorts of information on things like acne, breakouts, anti-ageing and wrinkles, basic skin care, body care, dry skin, exfoliants, eye care, ingredients, makeup, men’s skin care, oily and combination skin care, brown spots, redness, rosacea-prone skin, sensitive skin and sun care. You can also find a huge array of beginner’s guides on things like skin routines, SPF, boosters, exfoliants and retinol. Paula’s Choice’s award-winning range of AHA and BHA leave-on exfoliants gently and naturally remove built-up layers of sun damaged skin instantly unclogging pores, smoothing the skin’s surface, diminishing wrinkles, firming loose skin leaving it younger and healthier every day. As well as exfoliant products, Paula’s Choice also provides information on exfoliants including why you should exfoliate, what exfoliants are, how to use leave-on exfoliants and which exfoliants you should use. You can also discover information and the difference between BHA and AHA exfoliants, as well as the award-winning, number one best selling product worldwide- exclusive to Paula’s Choice. From a flawless complexion to kissable lips - create the perfect look for any occasion with makeup that is also kind to your skin at Paula’s Choice. Shop by skin type to discover makeup suitable for dry skin, normal skin, combination skin and oily skin, or shop by skin concern to find makeup suitable for anti-ageing, sensitive skin, very dry skin, blackheads and enlarged pores. You can als shop by size and discover full size, travel size and sample makeup, all of which is extremely affordable and high quality. Once you’ve filtered your make-up to find products that are suitable for your skin you can browse around to discover a wide range of products such as primer, foundations, moisture mist, cleansing cloths, shine trooper and lip gloss. If you are not satisfied with any product, for any reason, you can return it within 30 days of purchasing it and Paula’s Choice will happily refund the purchase price (not including shipping). Paula’s Choice specialises in skincare that delivers on its promises and provides only the best for your skin, no matter what your age. Paula’s Choice base their product development on scientific research making sure they provide only the best ingredients that include no irritating fragrances, they also don't sell products in jars and ensure that all day creams have a minimum SPF of 30. Discover straightforward skincare routines and top quality skin care products that are made with scientifically proven ingredients and that are free from drying alcohol, available for all skin types and problems. Shop online at Paula’s Choice with a discount code from us and choose from all this top quality skincare for less.